This recipe, with its Paprika-Brown Sugar Rub, yields a turkey with dark crusty skin. That's good—it will remind you of the crispy outside pieces of barbecued meats. What Is the Best Way to Remove Fat From Stock? Preheat oven to 350°. Combine first 3 ingredients. Remove giblets and neck from turkey; pat turkey dry with paper towels. Loosen and lift skin from turkey breast with fingers without totally detaching skin; rub butter mixture underneath skin. Carefully replace skin; secure skin at both ends using wooden picks to prevent skin from shrinking. Sprinkle 2 Tbsp. Paprika-Brown Sugar Rub inside cavity. Place apples inside cavity. Tie ends of legs together with string; tuck wingtips under. Place turkey, breast side up, on a rack in a roasting pan. Rub 6 Tbsp. Paprika-Brown Sugar Rub over outside of turkey. Pour chicken broth into roasting pan. Bake turkey at 350°, on lowest oven rack, 2 to 2 1/2 hours or until skin is well browned and a meat thermometer inserted into thickest portion of thigh registers 170°, shielding with aluminum foil during last hour of cooking to prevent excessive browning, if necessary. (Do not baste.) 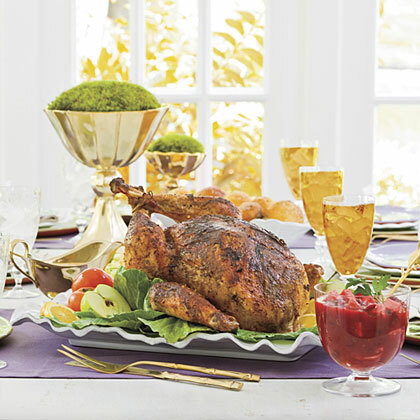 Transfer turkey to a serving platter, reserving drippings in roasting pan. Let turkey stand 20 minutes before carving. Melt 3 Tbsp. butter over medium heat in a medium saucepan. Whisk in flour, and cook, whisking constantly, 3 to 4 minutes or until golden. Whisk in 3 cups drippings, and bring to a boil over medium-high heat. Reduce heat to low, and simmer 5 minutes, whisking occasionally. Serve with turkey. Garnish, if desired. Used this recipe for Thanksgiving 2013 And this was a family favorite. Will be my go-to choice from now on. So very moist and the rub gives it a kick. Am also a new fan of smoked paprika - definitely made a difference and have now enjoyed it in other recipes. I've been using this recipe since 2009 and it is our family favorite! Here's the paprika-brown sugar rub recipe: PAPRIKA-BROWN SUGAR RUB Combine 1/2 cup firmly packed brown sugar, 2 Tbsp. kosher salt, 2 Tbsp. smoked paprika, 2 tsp. dried crushed red pepper, 2 tsp. onion powder, 2 tsp.dry mustard, and 1 tsp. coarsely ground pepper. Store in airtight container up to 4 weeks. Every Thanksgiving I try a new turkey recipe...Alton Brown's, Martha Stewart's, the list goes on and the turkey is always good, but forgettable. Last year, I tried this. Success! Moist, savory with lots of flavor, great skin...that rub and the garlic butter under the skin really made it stand out from the rest. I did a basic brine the day before. I think I've found my recipe for here on out!! This recipe is very easy. The turkey has amazing flavor and remains very juicy. I do usually wind up having extra rub, so now I reduce it by 1/3. I can't wait to make it this year. It is our family's favorite Thanksgiving recipe. Yum! Very tasty. Use cook times listed on your turkey. The low star ratings on this recipe are not warranted. Thanksgiving IS time consuming and common sense is needed when cooking meat. See my idea under the rating section of the rub recipe. Very good on a whole chicken. 350 for 2-2.5 hours will yield an undercooked turkey (even at 170 in the thigh). I did a 8.5 lb turkey for almost three hours and got it up to 180 in the thigh. Rub gets very dark. Great flavor though, just needs some tweaking in terms of turkey size and cooking time.